The inspection and test plan article provides you with information about inspections and tests which are used in manufacturing shops. In addition there are lots of linked articles which provides specific information about inspection and test plan for each equipment type. The working process starts with an agreement between the purchaser and manufacturer. The manufacturer provides the Proforma Invoice (PI) to the purchaser, which explains the equipment specification and related price. Then the purchaser issues the Purchase Order (PO), which confirms the proforma invoice. Before the start of manufacturing, the purchaser must provide an equipment inspection and a test plan (ITP) to the manufacturer. The ITP identifies all inspection points for the purchaser's inspector. Then the manufacturer needs to prepare the project quality control plan based on this inspection and test plan. The manufacturer notifies the purchaser's inspector in advance to attend at the factory for witnessing the inspections and tests. The communication and coordination channel between the manufacturer, purchaser inspector and purchaser are agreed to in the Pre-inspection meeting (PIM). Based on the international practice, the manufacturer sends a notification to the purchaser, and the purchaser reviews the notification, and after approval sends it to the inspector. Then the inspector will go to the manufacturer's shop to witness the test or inspection. The purchaser's inspector will send the inspection visit report to the purchaser. The Purchaser can assign its own inspector, which is its direct employee or hire a third party inspection agency to carry out the inspection. The ITP have a tabular format and the content extracted from the construction code. In each row of the table, there is a quality control and inspection requirement and this determines which party is responsible for control and inspection. The before Manufacturing section consists of the Pre-Inspection Meeting (PIM) and review of the quality control documents that need to be approved before start of manufacturing. Hold point(H): Hold on the production till TPI Inspector performs inspection and supervises the required test. In general, attendance to the PIM meeting, raw material inspection and identification, Post Weld Heat Treatment Review, Hydrostatic Test, Performance Test, Run-Out Test and Final Inspection are Hold points. Normally, manufactures shall notify the TPI Inspector 7 working days in advance. Witness Point (W): The manufacturer shall notify the client and TPI Inspector, but there is no hold on the production. 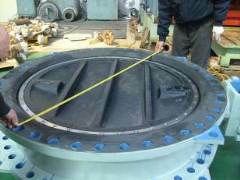 The client can waive this inspection based on its discretion and inform the TPI Inspector. Spot Witness (SW): for items with spot witness, the manufacturer shall notify the TPI inspector as fulfilling the monitoring. For example one random visit for all of the UT Tests or one or two visits for whole surface preparation work for painting. Review (R): Review means Review document, which includes the review of quality control records, test reports, etc. When the TPI Inspector makes a visit for a hold or witness point, the inspector can review the related documents.